Jonathan Bird is an accomplished documentary film producer and underwater cinematographer whose work has aired in over 50 countries. He specializes in natural history subjects and works on assignment for major productions all over the world. He is currently in production on an OMNIMAX® film called Ancient Caves. His most recent project is a giant screen film for the fulldome theater market called Space School. Produced in association with NASA, this immersive documentary takes viewers underwater to train with astronauts. The film was released in 2015 and has received several awards including Best Photography at the Fiske Fulldome Festival. Seasons 1-4 of Jonathan's family underwater educational adventure series Jonathan Bird's Blue World are now airing across the USA on public television. The pilot won the Cine Golden Eagle, and the series has so far won a total of eight Emmy Awards! Season 4 was released in early 2014. Season 5 is currently in production in 4K UHD. 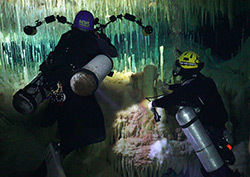 In 2009, Jonathan completed a feature-length high definition film about coral reefs called Secrets of the Reef that was shot in 2006/2007 in the Pacific. It is in international distribution and can be seen on Amazon VOD. In 2009 Jonathan was the Director of Photography and Line Producer for National Geographic's Most Amazing Photos: Artificial Reefs, which aired on National Geographic Channel around the world 2010-2013. He produced and directed Sharks: Deep Trouble, a film about pelagic sharks for National Geographic Television in 2005. This film aired all over the world in 2005-2007. (It was also marketed under the name Sharks of the Ocean Desert.) Available on Amazon VOD. Jonathan completed production on another shark film for international release in 2006 called Sharks: Masters of Survival. It is in international distribution with his television distributor and is available on Amazon VOD. In 1996, Jonathan completed his first full-length documentary. Sharks...The Real Story was co-produced by Art Cohen and aired on PBS in the U.S. throughout 1997-98. It also aired on Discovery Channel UK and in over a dozen more countries. A 48 minute cable version called Sharks: Search for a Feeding Frenzy aired on the USA Network throughout 2000-2001. Jonathan's film Beneath the North Atlantic, completed in late 1998, aired all over the world, including Discovery Channel UK, Discovery Channel Canada, Discovery Channel Germany, La Cinquieme (France) and in a dozen more countries. Not only does Jonathan consider this film some of his finest early work, but it was a very successful film as well. 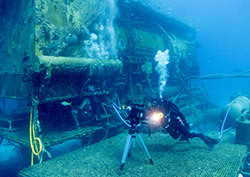 In 2004, Jonathan and long-time collaborator Art Cohen released The Silent Wrecks of Kwajalein Atoll, a film about the WWII battle of Kwajalein Atoll. 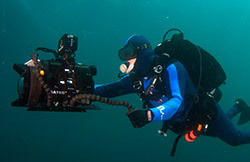 Jonathan has written, shot and produced twelve educational films for the non-profit organization Oceanic Research Group. These films, designed for use in the classroom, have won numerous awards such as the CINE Golden Eagle, CINDY Gold and Bronze, CINDY Special Achievement in Cinematography, Bronze Apple, and the KID'S FIRST award. He has produced or co-produced four episodes of the news magazine program "Chronicle" on WCVB-TV, the ABC affiliate in Boston. Two of these programs have won Emmy Awards. Jonathan received the coveted 1997 New England Emmy Award for Individual Achievement in Cinematography. Jonathan is also an accomplished Final Cut Pro and Premiere editor. His CV is on-line here. 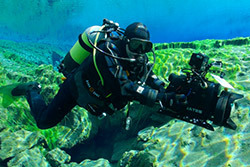 Jonathan Bird Productions is a supplier of underwater stock footage for television and non-broadcast applications all around the world. Jonathan's work has been used extensively by just about every broadcaster you can think of. His footage is represented by Oceanfootage and directly through Jonathan Bird Productions. Need something? Drop us a line and we'll let you know what we have. 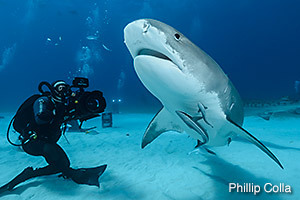 Jonathan filming Tiger sharks, Bahamas.  Watch episodes of Jonathan Bird's Blue World! More than 80 to choose from!  Trailer for Secrets of the Reef. Underwater stock video footage from Jonathan Bird Productions.